Paul O’Connor is the Director of Basketball and Business Development at Kids in The Game. In addition to running sports programs and teams, KinG provides recess, after-school, early drop-off fitness and physical education programs to schools throughout the city. Paul grew up in Trumbull, CT. After graduating from Ohio University he received his Master’s from Providence College. Paul started playing basketball at age five and hasn’t stopped since. While he played other sports recreationally, coming from a basketball family (his father, uncle and aunts were all coaches, and all played at least until high school and some into college), Paul knew he wanted to be involved in the sport at some level. As he tells it, however, he knew relatively early that his involvement wouldn’t be because of his talent on the court. “If you can’t play, you coach, so that is what I did.” Paul started as a manager/video coordinator at Ohio University and then became a graduate assistant at Providence College with Coach Ed Cooley. After two years at PC, he had the opportunity to become the Director of Basketball operations at Central Connecticut State University. After that, he went on to be an assistant coach at Kennesaw State University. How would you describe yourself as a coach? My coaching style has changed a lot since leaving the college ranks. I’ve had to employ a lot more patience and understanding coaching at the youth level. Kids are in it for completely different reasons and they all need to be coached differently in order to be the most successful. I’m definitely a “players coach,” and try to get to know all of my kids on a personal level. I like teaching the X’s and O’s of the game, but what I really enjoy is the challenge of getting kids to attack the mental side of the game. Trying to get them to keep their composure during the games, be a great teammate and communicate, those are the most important things to me. We have numerous different programs that we offer to schools throughout the year. We offer PE, recess and after school sports/fitness programs. We have had a ton of success implementing our recess programs with schools because it’s such a hectic and unorganized part of the day. We are able to come in and provide some structure through organized play and games where the kids not only learn the basics, but also learn how to play with each other. Data has shown that the schools we work with have seen a decrease in bullying, a decrease in injuries and an increase in student readiness to return to the classroom following the recess period. We offer two types of after school sports & fitness programs. Schools will come to us looking to offer enrichment style classes. We can offer sports, dance, yoga, Zumba, and much more. The other option is an all-encompassing model where we organize and manage the entire after school program. For PE, we offer an alternative and personalized curricula in PE, tailored to a school’s population and specific needs. Instruction includes fitness-focused activities and skill development for each grade level that are in compliance with New York State standards. 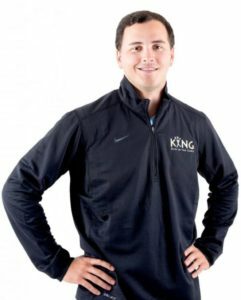 What sports programs does KinG offer outside of its school-based programs? At present we offer basketball (King Hoops – elite travel teams for 5-11thgraders), soccer (King FC – PreK – 4thgrade), track (King Speed – includes a competitive cross country, indoor and outdoor track club, free open runs with the NYRR and track and field clinics) and volleyball (King Spikes 16U Club Team). We also offer UWS (PreK-4thgrade) and UES (2-8thgrade) basketball clinics as well as more high-level clinics for 1st-8thgraders looking to take their game to the next level. What is different about the sports teams KinG runs? Our coaches! All programs like to say this but we really do have fantastic coaches that have coached at the college level or played professionally. Besides that, they all have a very good understanding of how to connect to today’s youth and do a great job of teaching them the skills of the game. What is special about KinG’s summer sports camps? Nowadays they’re specialized games everywhere for kids that enjoy very specific activities. We like to offer a variety of options for our campers to attract a wide variety of children from all over NYC. We want to make sure our kids are moving as much as possible throughout the summer while enjoying arts, STEM, field trips, and more. What about KinG makes it different than other youth sports programs? What makes us different is the variety of programming we offer. There are tons of recess-only programs, afterschool-only programs, and tons of summer camps. We are able to build real communities and partnerships with the schools and families we work with because we offer programs year round. Families usually learn about us through our school programs, then they come to our summer camps, and as their kids get older they join out travel sport teams. We’re a one-stop shop for sports and fitness programs here in NYC. How have you seen the landscape of youth sports and basketball change? There are so many more programs and opportunities for kids nowadays, which is a fantastic thing. There are unlimited camps, clinics, workouts, teams and programs throughout NYC. Back in the day, there were the elite programs and the parks and that was about it. It’s great to be able to get more kids involved at a young age due to all the options and programs that are now available. What has been your proudest moment as a coach/youth sports executive? I’ve been working with a group of kids within our basketball programs since I started here at KING and they’re now juniors in high school. I’m super proud to see the strides that they have made and the results of all their hard work paying off. A lot of them are now receiving interest from college coaches, which is everything we want for our kids. What do you look for when you hire a coach to work with kids? What is their “why”? What I mean by that is why do they coach? That is all that matters, everyone else can improve on their knowledge or coaching strategy. What was the best advice you got from a coach? What is your most treasured sports possession? My basketball card collection & anything related to Duke. What is your favorite sports venue in New York City and why? Besides the mostly make-shift gyms we have to practice in, I’m going to have to go with MSG because as a kid I got to play there at halftime. Went 1-3 with 2 points, still proud of that. Hitting a game winner playing for my dad.